(CNN) -- Remember when the original Terminator -- Herr Schwarzenegger in the role that made him a movie star -- devastated an entire police station? 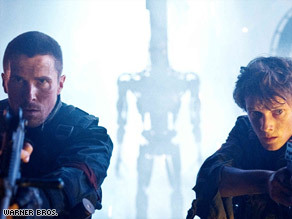 Christian Bale, left, and Anton Yelchin battle the machines in "Terminator Salvation." Subsequent films in the series have upped the ante in terms of action and spectacle, but they have never topped the shock and awe of that comparatively simple sequence, when we realized what a formidable adversary this thing really was. Although "Terminator Salvation" recovers some of the ground ceded in the campy "Rise of the Machines," this half-smart fourth installment has nothing to compete with that scene in "The Terminator," not even when it features a 50-foot model. Like its shorter cyborg cousins, the bigger version lacks the aim and accuracy Arnie exhibited with such ruthless efficiency. We are in an ashen post-apocalyptic California, 2018. Thanks to the nuclear devastation created by Skynet, Los Angeles lies in rubble and the machines control San Francisco -- less a metropolis than a foundry. Still, the human resistance is also well equipped with jet fighters, submarines and plain old-fashioned artillery. The key to stopping the T-800 in its tracks is a well-placed bullet in the cranium, not that this stops the Resistance from experimenting with more creative methods of pressing the stop button, including magnetic landmines, immolation and dropping various heavy objects from a great height. Most of these are as effective as Wile E. Coyote's strategies in a Road Runner cartoon. John Connor (Christian Bale) is the Resistance guerrilla all-rounder, the kind of action hero who countermands his superior officers, commandeers helicopters, descends into mineshafts and dives into stormy seas to rendezvous with a submarines, all within the first 15 minutes. Buff and almost as gruff as the dark knight, he's come a long way from his bratty Edward Furlong days. In a disconcerting touch, the young man who will become his father, Kyle Reese (Michael Biehn in the first movie), is played by scrawny Russian-born teenager Anton Yelchin (Chekov in "Star Trek"), who looks a lot more like Furlong -- and indeed "T3's" Nick Stahl -- than Bale does. Casting conundrums aside, "Terminator Salvation" downplays the time-traveling trickiness and Armageddon angst that fired up the first films. Instead, director McG evidently sees this as his World War III combat movie. It's not unlike a traditional WWII movie, with multiethnic civilians herded into transports and shipped to death camps under armed guard, albeit with a perverse high-tech sheen. Despite the title, this is actually a redemption story. Australian actor Sam Worthington has the meatiest role as a death row prisoner who comes back from the dead years later, dazed and confused, and falls in with the remnants of the Angeleno resistance. There's not much left of the feminist perspective Linda Hamilton embodied with such fierce conviction in the first two films, and for all its desperate bluster about "humanity," it's impossible to believe there's anything at stake this time around. James Cameron (age 54) came from a generation haunted by nuclear apocalypse. McG -- who is 40 -- seems positively sanguine about the prospect of a neverending war, an interminable battle without winners and losers but with action highlights evenly spaced every 10 minutes. iReport.com: What did you think of the new "Terminator"? To his credit, McG shoots a more coherent skirmish than Michael Bay (and prefers a longer take), but the gap between the Terminator movies and "Transformers" is diminishing along with any vestige of adult entertainment. In the virtual era, nobody we care about stays dead for long; there is always a second life just around the corner. They've even stopped numbering the sequels now. "Terminator Salvation" is rated PG-13 and runs 115 minutes. For Entertainment Weekly's take, click here.